A couple of years ago (could be more) I bought a pattern from Sew Fresh Quilts and made this dog cushion……. ………as well as this block which is yet to be made into anything. I might make another cushion out of it and put it in the raffle at the upcoming old and disabled doggy fundraiser Christmas Fair, if I get the time. I think I must have done a similar thing with the first one as I can’t find it anywhere. Flushed with stitch and flip success, I bought a more Christmas themed block last year but, unfortunately, my Mum suddenly became very ill and such things got put aside. Looking for a new project to work on with my sewing friend on a Wednesday afternoon, I remembered the reindeer and we started searching through our scraps of brown, black and white fabric – actually quite difficult colours to find as brown and black fabric isn’t something I buy that often Anyway, we found enough between us and shared out what we had. I must say, it was a different prospect to the dog as those antlers are formed of quite small pieces. Accuracy is not my strongest point when titchy bits of fabric are concerned and I found trying to keep the seams and resulting larger pieces straight quite challenging which is a euphemism for ‘I undid seams lots of times, had to re-cut fabric on a few occasions and swore a lot’. No fault of the pattern at all, I must say, but I find working in somebody else’s workroom a bit weird. For this reason, I’m not that great in lessons or workshops – too many distractions. I like to have my own things around me and to work at my own pace. Also, we only meet once a week for a couple of hours and, often, the project we’re working on goes ‘off the boil’ for me. Anyway, after a few Wednesdays of plumbing the depths of my Anglo Saxon vocabulary, it was done. But what to do with a pieced reindeer head I hear you ask. I’m big on blankets around the place but not so keen on cushions or wall hangings – although I have been known to succumb now and again. 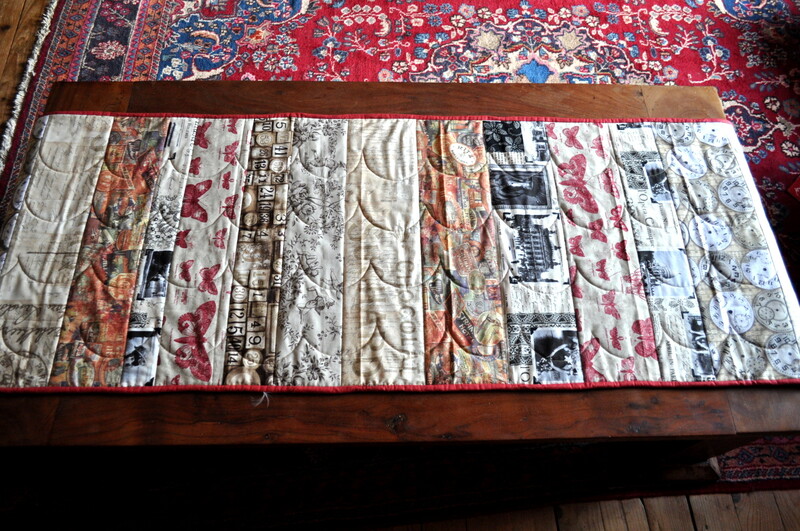 Remember the table runner for my coffee table I made from a Tim Holtz fabric selection recently? 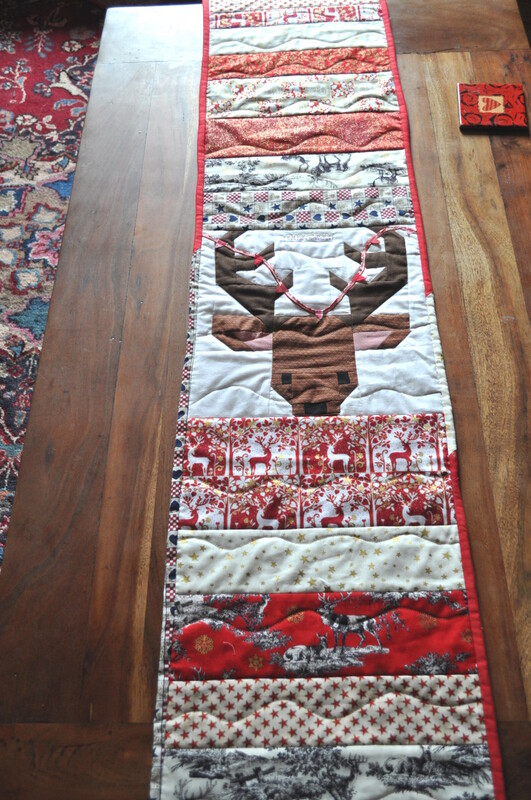 Well, I thought I could make a more Christmassy one using the same quilt as you go method as before but with the reindeer head in the middle and various strips of leftover Christmas fabric either side, thereby using up some scraps – and some of my friend’s too as she had lots more than me. First I bedecked his antlers with some festive bunting. Not at all because I was trying to hide the fact that my piecing left something to be desired. As if! Then I joined scraps of Christmas fabric in strips of varying widths on to the backing and batting. Then I quilted it some more using wavy lines across the width and used a double fold binding stitched down by hand on the back as I do on quilts. 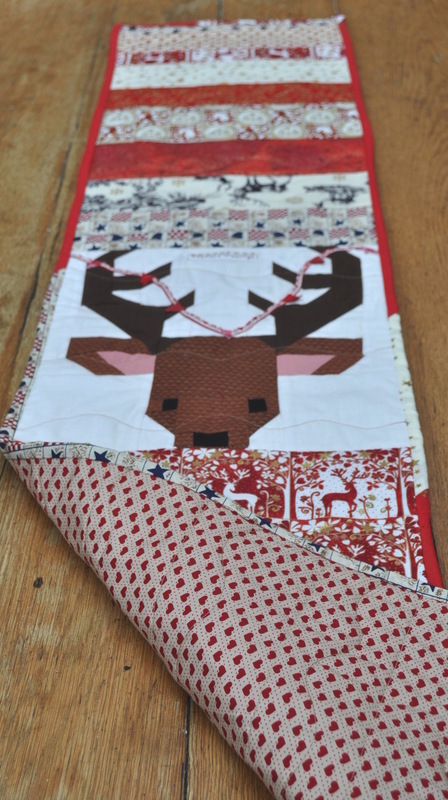 So, I don’t think I have any more Christmas scraps left now – I used up the smaller pieces on the binding. Result!! Oh, and I found a felted bead in my stash of ‘things’ – I don’t know where it came from, but I knew exactly where it could go. Joining in with Kate & Gun’s ScrapHappy Day Challenge which focuses on using up your scraps of fabric/yarn/paper/wooden offcuts/anything leftover. More details and list of participants here. Now I must go and convert more tea towels into aprons for sale at the Twilight Retirement Home for Dogs Christmas Fair on Saturday 24th. I know how to have fun. Do you ever have those times when you’ve not even thought about a a new project but, all of a sudden, something pops into your head and you have to start on it there and then despite having numerous others on the go? Of course you do. and my thick felted wool ironing pad thingy which is in constant use. 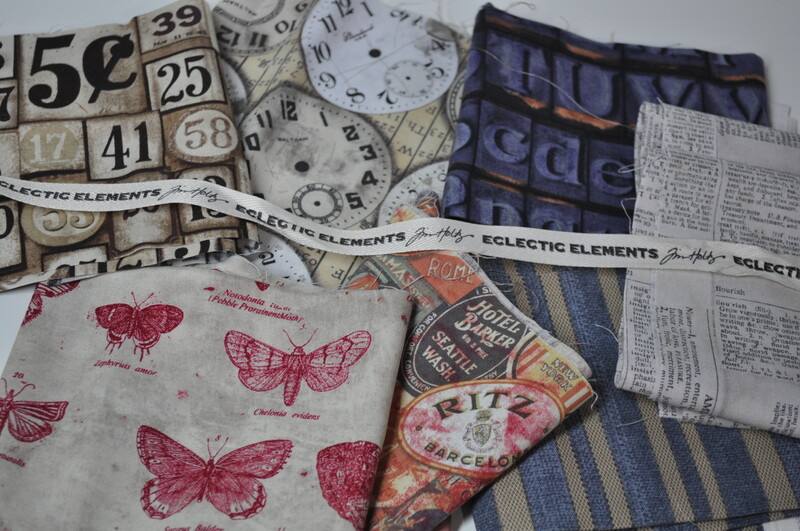 Anyway, one of my impulse purchases from them was a stack of fabrics from Tim Holtz called ‘Eclectic Elements’ which has languished in my stash ever since as I couldn’t imagine any of them in a quilt and keep forgetting about them when I need something a bit ‘quirky’ in a craft project. 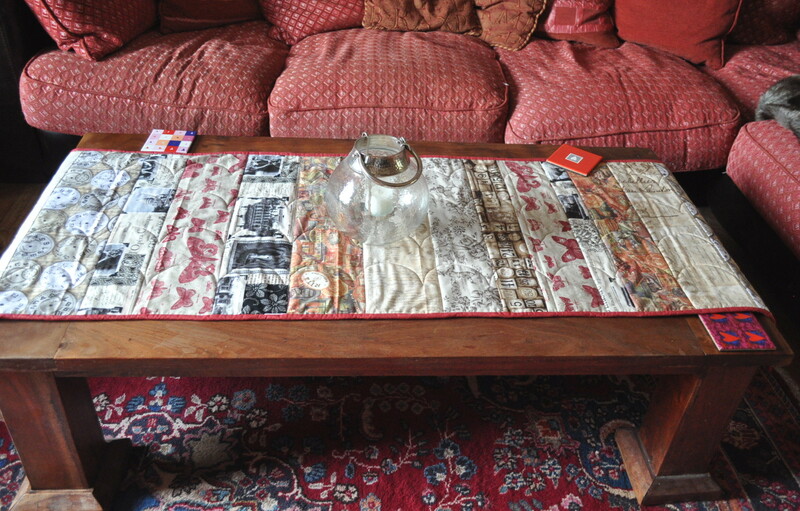 I decided (all of a sudden as previously mentioned) I needed a table runner for the coffee table in the living room. My décor – such as it is – in there is not really something calling out for my usual selection of quilting fabrics so I thought these would work being more subdued in tone. I took out the blues as they definitely don’t ‘go’ with anything in the room and added a couple of toning fabrics from elsewhere in my stash. 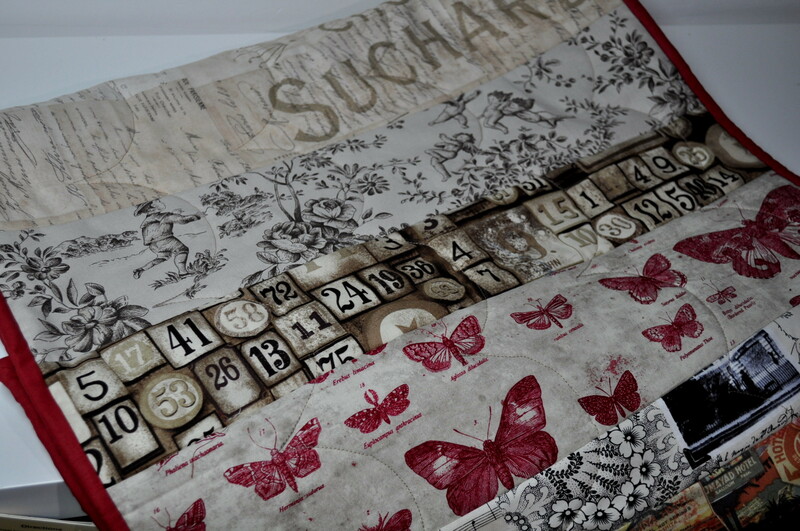 The ‘Suchard Chocolat’ piece was in the original Eclectic stack but I had already sewn it in to the runner by the time I’d thought to take a photo because it’s my favourite piece and I used quite a bit of it as the central strip. My second favourite is the butterflies which might be moths – must put my specs on to read the teensy writing, something I’m finding myself saying more and more often these days. I was intrigued by a method I saw here where you cut out the backing and batting to size, cut your strips of fabric and lay one centrally, right side up, across the backing and batting. Then, you lay the next strip right side down on top of the first and sew a quarter inch seam, then press seam open. On the other side of the first strip, repeat with another strip and carry on like that, alternately in each direction, until you reach the ends of the runner. 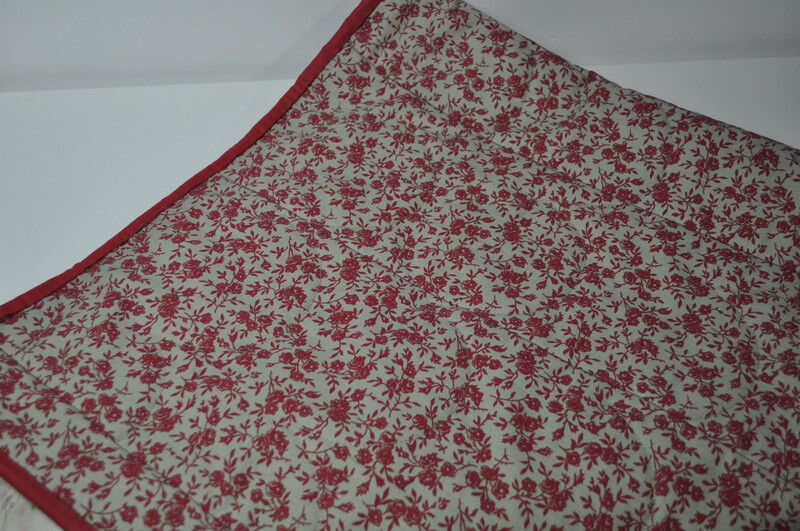 I had this red and cream floral fabric in my stash which I think coordinates well with the other fabrics and also with the room it will be used in which has a red theme going on but not a bright red. 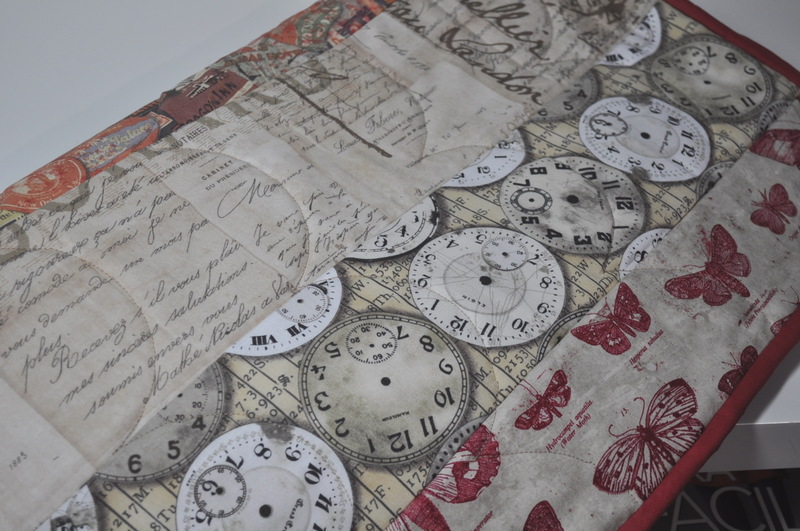 So you have, effectively, sandwiched and quilted the layers at the same time – a sort of alternative ‘quilt as you go’. 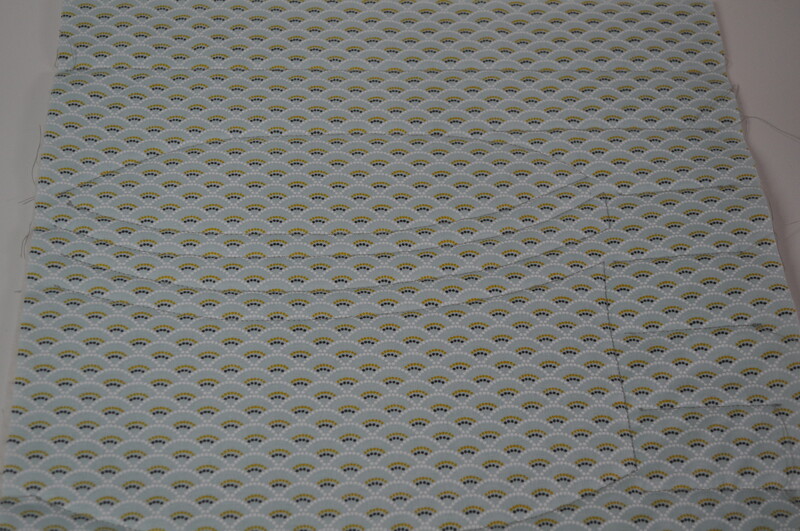 You can leave it like this or add some further quilting – which I did, using a very French makeshift template. I bound it the traditional way with a double fold binding and some plain red from my stash. I’m surprised how much the quilting pattern showed up once the runner was in position – especially here where the sun was shining right across it. Oh look, there’s blue in my rug – I could have left the blue fabrics in after all. I would be drummed out of Instagram for not plumping up my sofa cushions before a photography session. Still, let’s call it ‘keeping it real’ this time and be amazed there’s not a dog or three draped across it. So, not a ‘pretty, pretty’ table runner one often associates with quilting projects but I don’t think that would have worked in this room so I’m quite pleased with it. Now to get back to whatever it was I was supposed to be doing when this popped into my head. A Question Of Quilts – Well, Two Actually. Inspired by Cathy’s big, beautiful hexie quilt top in progress she showed us recently, I ferretted around in my workroom and unearthed my box of hexies started a few years ago. I had bought some thin card pre-cut hexies along with some fabric ones and, filled with the enthusiasm that is always evident at the start of a project, I started making them. Although I did put one ‘flower’ together. As you can see, this range of fabrics is very retro – it’s Chloe’s Closet for Moda called ’30s Playtime’ but there have been many variations of these so I don’t know which one this was. They are all along the same lines however. Then, probably the year after or maybe later, I bought a jelly roll of ’30s Playtime’ which is a different variation but near enough to make no difference. I haven’t unwrapped it yet but I’m hoping there are more pups and bunnies. I think I haven’t progressed much with the hexies because I have no clear idea what I’m going to do with them. 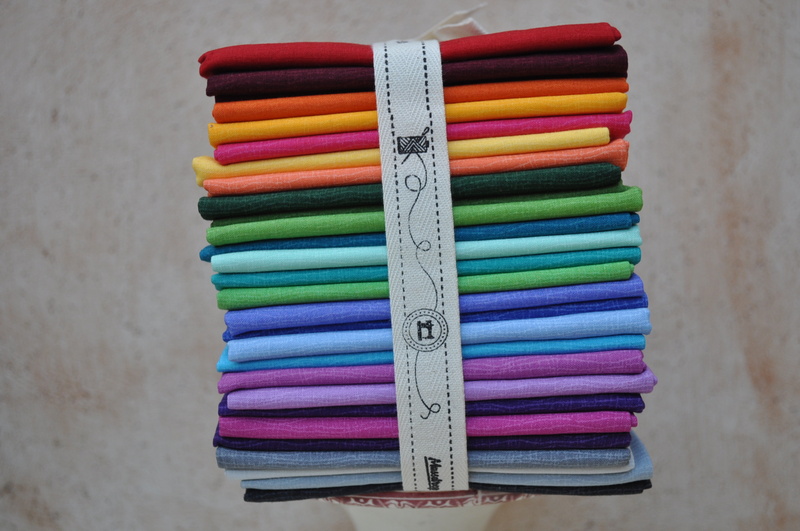 I know, almost certainly, I will never have the patience to make a whole quilt with them. 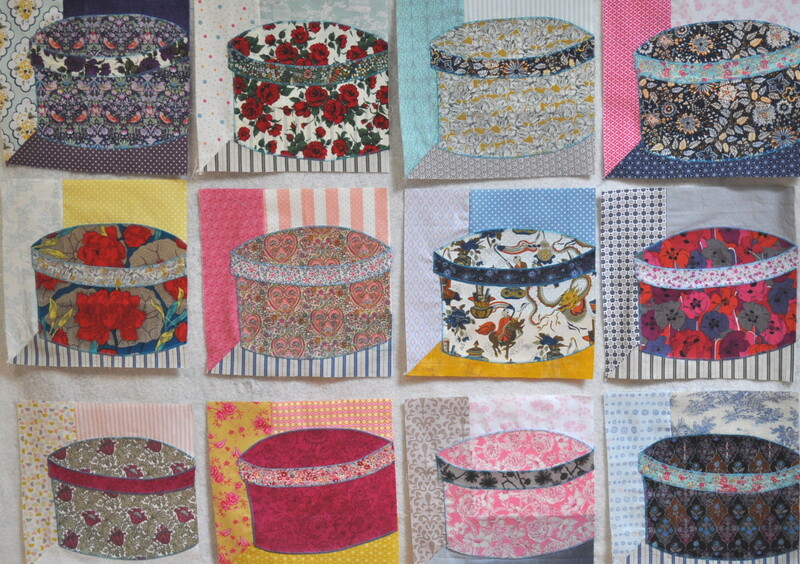 So, my question is, do you think I could join the ones I do make into a row – or however many rows I have enough hexies for – levelling that row (or rows) off to make straight lines – then make the rest of the quilt top with the jelly roll strips, inserting the hexie rows wherever they look right? I also have some larger fabric hexies – just waiting for their paper/card inners – so the rows of hexies would be slightly different sizes. Any ideas? Please! I have searched Pinterest without much joy as everybody else is obviously far more patient than I am and have mostly made quilts out of hundreds of little hexie flowers or similar. 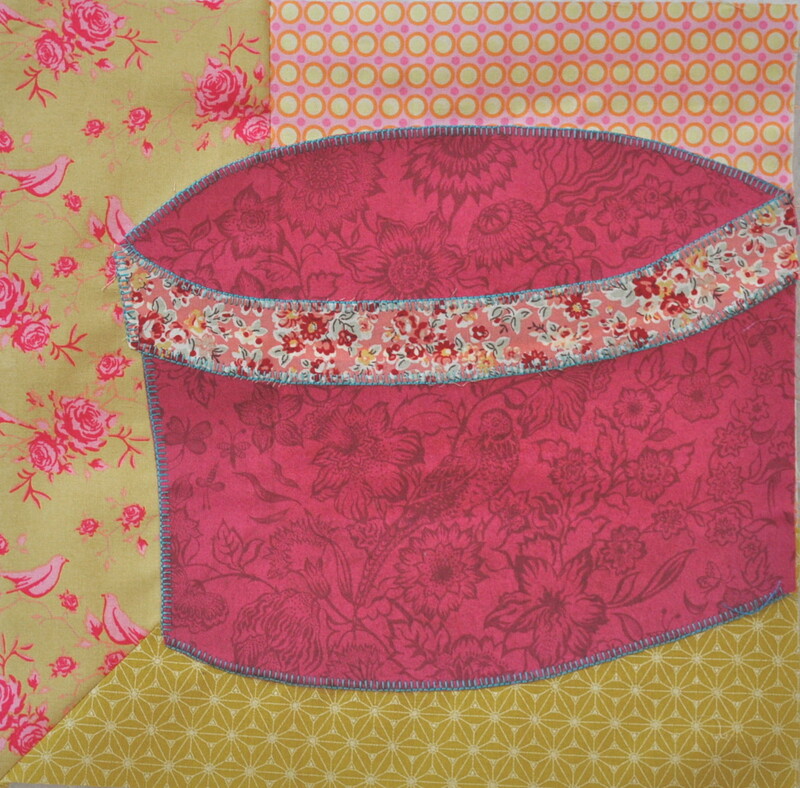 Have you ever used double gauze fabric in quilting? Double gauze has 2 layers of very thin gauze fabrics fused together, to create a soft, full bodied fabric. I have some in the perfect colour for backing my F2F blocks which are all in neutral colours with a sort of ‘dirty’ pink – let’s call it ‘vintage’ pink – as a highlight. When I get around to putting the blocks together, I will be using the ‘quilt as you go’ method for construction which, for the non-quilters amongst you, who probably aren’t reading this anyway, means I will make a wadding sandwich with the top and backing squares and quilt them individually, then join with sashing. So, as you can see, my hedgehog block is sitting nicely against the colour for display purposes but I just wondered if any of you have any experience of this fabric in quilt making or in any other sewing projects. Thank you muchly for any ideas, suggestions or general comments. I know I can count on you. I can feel myself getting back into the swing of sewing and, to that end, have bought a couple of new dressmaking patterns and the fabric to go with them, I know, I know, I already have plenty of patterns and fabric but I needed to be newly inspired. That’s my excuse and I feel it’s a good one. But first! I really need to get my hatbox quilt wall hanging off my WIP list and up on the wall so that I don’t feel guilty about starting a new project. ‘What?’ I hear you ask -‘ since when did she care about such things?’ Well, since recently and I don’t know how long it will last so I’m making the most of it. A sneak preview for you – the clips will not be part of the finished project I promise you. You may remember I have elicited your opinions on several occasions about whether a certain block would fit in with the rest of them or not, which layout of several options you preferred, etc. etc. 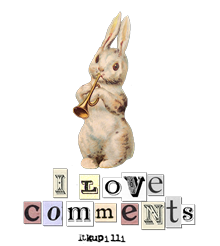 All opinions duly considered and mostly ignored of course but that’s what makes it fun. Well, when it came to adding the sashing in between the blocks I couldn’t be bothered to dig out my old posts and photos to see what had been decided so flung them down on the floor any which way and thought ‘Aha, that looks good, how wonderful a random flinging can be’. So I took a photo. Then, I looked at the photo and immediately saw that I had placed some of the hatboxes higher on their backgrounds than others so things weren’t lining up. Disaster! If I ever make this quilt again that is just one of the many things I would look out for which I should have done the first time of course but you live and learn – though sometimes I think I just live. A couple of the other things I would do differently are to make the ‘wallpapers’ all the same and hand quilt them – I’ve no excuse as I made them as quilt- as -you -go blocks so it wouldn’t have been too difficult. I was forced to put all the ‘lower’ boxes on the top row so that they would (more or less) line up with each other so, in the end, my layout was decided for me albeit not by you. Thank you for your help and opinions anyway. You can see above that I put vertical strips of sashing on the blocks and joined each of the two sections of six blocks with two horizontal strips. This meant there was only one long (ish) vertical strip to grapple with down the centre. 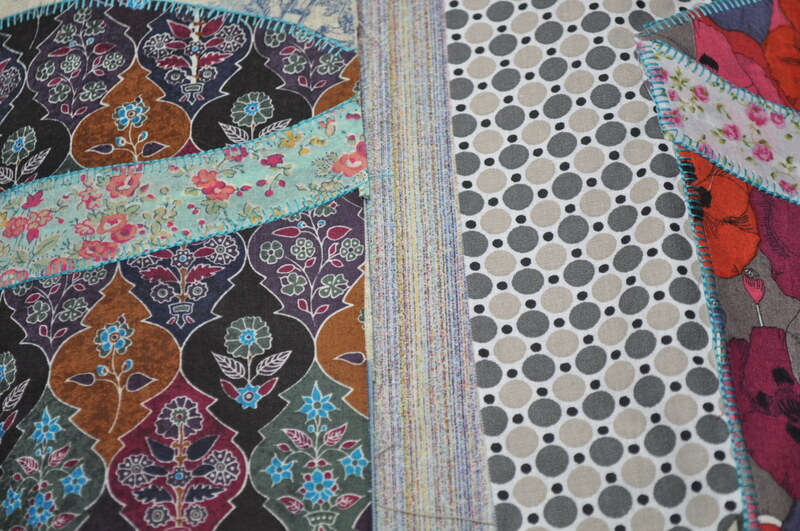 My troubles then started as I wanted to put wider sashing – some might call them borders – around the edges. My sashing fabric is another Liberty tana lawn which has a sort of wood grain effect that I hope will reinforce the impression of shelving – an impression helped by having wider woodgrain top and sides I feel. I experimented several times with top, bottom and batting layers until I found a method that worked for me. I can’t tell you how much unpicking was indulged in and how many anglo saxon words were retrieved from my memory and bandied about the place. Luckily, I only had one helper and she doesn’t mind a bit of cursing just so long as it isn’t directed at her. 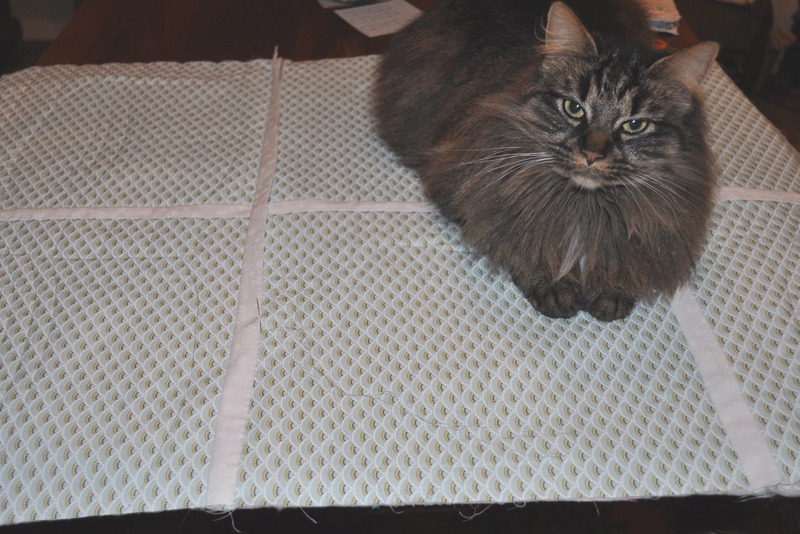 Here she is watching me hand stitch the back sashing down – I suppose she is giving me a bit of an ‘old fashioned’ look. Perhaps I’ll mind my Ps and Qs in future. I won’t go into the mechanics of quilt-as-you-go here because if you are not a quilter you will be bored to tears and, if you are, you probably already know about it. 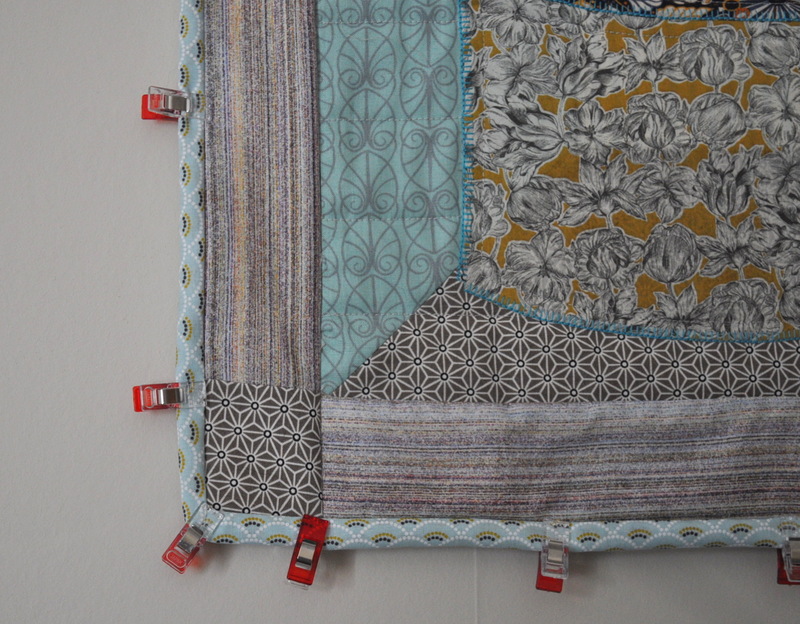 Basically, it avoids having to wrestle a large quilt (or medium sized wall hanging in this case) under a domestic sewing machine but it can also make hand quilting a more manageable and portable project. So, here’s the back which I almost like as much as the front but the photo was taken before I attached a hanging sleeve or binding. But first I have to hand stitch that binding down on the back – where’s my pain relieving crafting glove? A Liberty Sale? Well, I Had A Good Excuse. 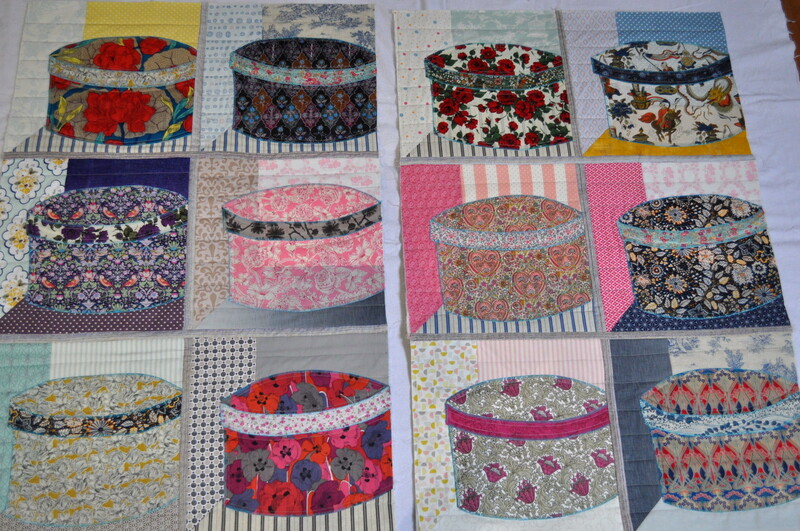 All the blocks are now finished for my Liberty Hatbox Wallhanging and I have the fabric for the backing, the sashing and the quilting can begin. This bright one was a bone of contention as I didn’t feel it went with the rest of the blocks although lots of you did. I made another one to try it out. 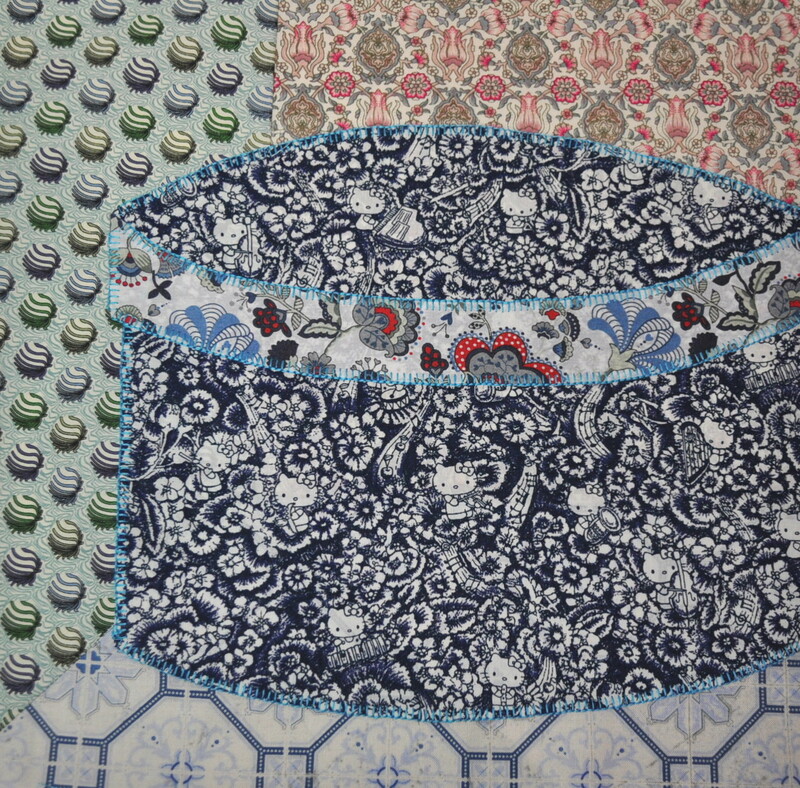 The hatbox fabric is a Liberty of London tana lawn which has a musical ‘Hello Kitty’ theme and I’ve been looking for an excuse to use it. I don’t actually prefer this block to the other one but I think it fits in with the others better. Here’s the first trial layout which includes the bright one. and here’s the second that includes the Hello Kitty one. What do you think? The jury’s still out and I haven’t joined anything together yet. I chose this fabric from a local shop for the backing. I was going to do it using scraps or just any old thing but, in the end, I wanted something I liked because even if you won’t be able to see it I will know it’s there. You can just make out the simple machine quilting I’ve done – it has to be simple machine quilting otherwise I can’t do it 🙂 . Here’s a front view of the one and half blocks I’ve quilted so far – well I’ve quilted two blocks really but couldn’t get two complete ones in the photo and still show the quilting. Still, you get my drift. 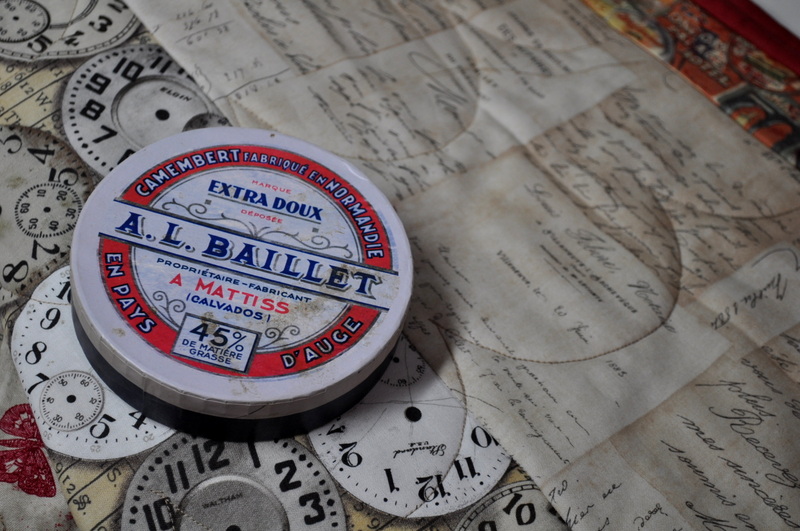 I’ve just echoed the lines of the hatbox and done some widely spaced horizontal lines across the background. 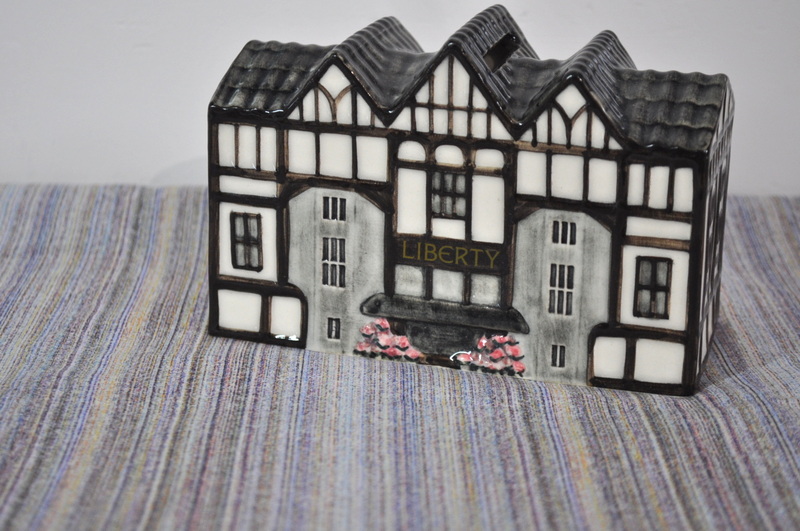 I might have added the Liberty shop money box to my basket at the same time. Oops! I might make it into a cushion – or a beach bag. 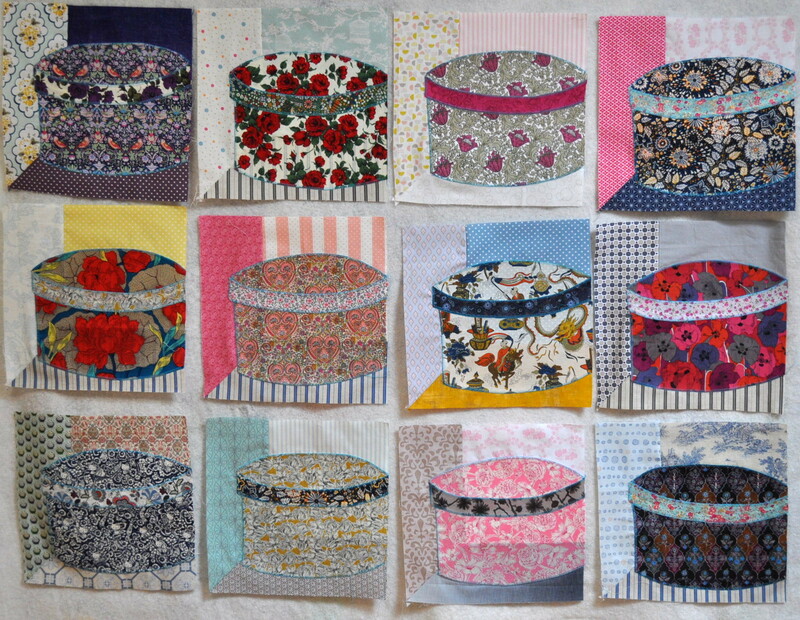 Only ten hatboxes left to quilt for my wallhanging and now Kate over at Tall Tales from Chiconia has completed all the hatbox blocks she needs for the quilt she’s making with hers so she can begin thinking about quilting and assembly now too. Don’t forget to let me know your thoughts. 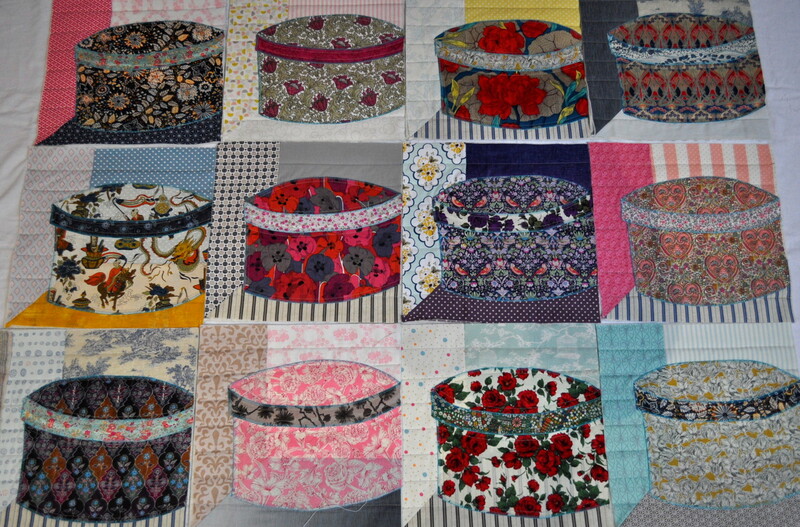 It’s the end of March already so it’s time to show and tell the three hatbox blocks I’ve finished in time for this month as pledged to Kate over at Tall Tales from Chiconia. Kate is making a full size quilt from her blocks so needs to make gazillions plus she has been battling Hurricane Debbie for the last couple of days over in Australia and has had other things on her mind so if she hasn’t made her three this time I won’t be casting aspersions – even though we did have a bit of snow here the other day accompanied by thunder and lightening which, to be fair, only rendered me slightly perplexed rather than full on terrified. Here’s a bit of Chinoiserie for you as a change from florals. As you might remember, I’m using Liberty of London tana lawn for all the hatboxes and scraps of other fabric for the backgrounds. I bought this when Liberty had a 50% off sale recently – I did give you all a heads up at the time and apparently cost some of you money. The book that this quilt pattern comes from – Passionate Patchwork by Kaffe Fassett – has been on my bookshelf for ages and seems to be quite hard to get hold of now (at a reasonable price) . I had always fancied making this but was newly inspired when Kate started hers. Some very art nouveau style flowers here – would they be fritillaria or some sort of poppy do you think? – or do you know? These are definitely poppies – even I know that – and this one might be my favourite this month, although I do like the Chinoiserie one at the top just because there be dragons. Unlike Kate, I’m only making a wallhanging 4 blocks across x 3 blocks high so I only need 12. I’ve already made 9 but I’m not sure about one of them so there may be 4 still to go. Then I’ll have to think about how I’m going to quilt them – I’m not convinced about the suggestion in the book. 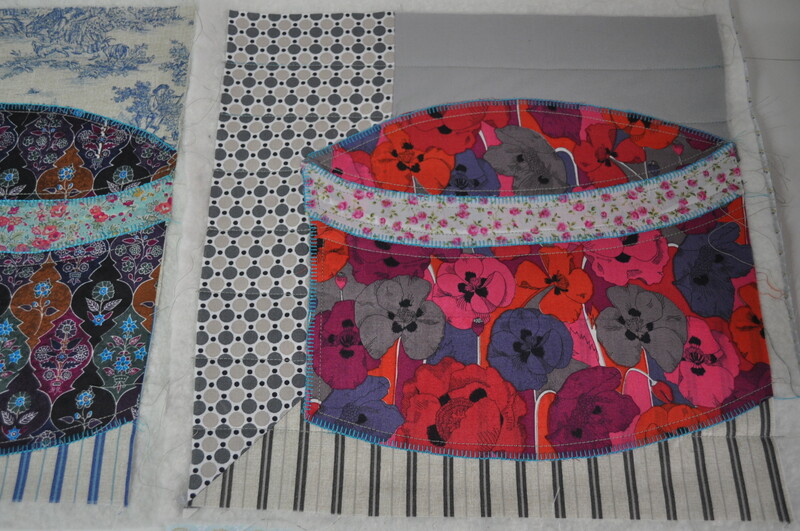 I’m going to do each block separately using the quilt as you go method. If you quilt, how would you tackle it – something simple perhaps or something more squiggly? Just a quick post to show you that I really did manage to finish my ‘man quilt’ in time to give it to Mr. Tialys for Christmas. Thanks to Kate for organizing nine quilters for the F2F block swap again this year meaning that, apart from the blocks I made for myself , I also received 24 blocks from Australia, the States, Sweden, the Netherlands and France all diverse and gorgeous in my chosen colours. This swap, just as last year, helped me to improve on my existing skills and develop some new ones – foundation paper piecing is my new addiction. Thanks also to Kate for encouraging me to finish it by blogging about the Quilt As You Go method which we were both using to finish our quilts, mine for a Christmas gift and her own for another charity auction to raise money for Ovarian Cancer Awareness which you can see here. Here’s the back in case he gets fed up with looking at the front where you can see more clearly – though not too clearly I hope as my seaming wasn’t always spot on (or anywhere near) – how the blocks are sandwiched together, quilted and then joined with strips. 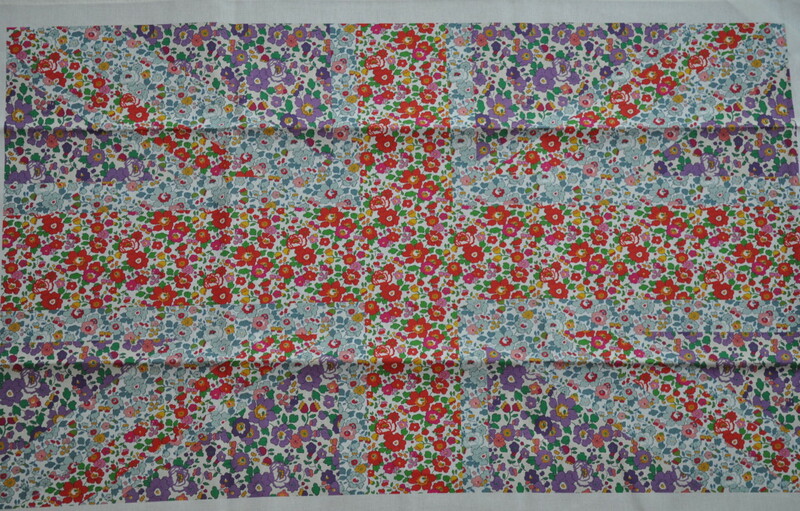 This quilt will go and live in London to keep Mr. T. warm in his ‘commuter flat’. Some lovely blocks were sent to me and, because the full length photo doesn’t do them justice, I folded the quilt in half and photographed them separately so you can see each block more clearly. Unlike Kate I don’t live in Australia and the quilt was too long to hang on the washing line without draping on the frosty grass so I had to take the photos indoors on a larger bed than the quilt is intended for – although it is fairly large at about 65 inches wide x 78 inches long (1.6m x 1.9m). I have been laid low by my first cold in years – which I could have coped with – but it turned into laryngitis. I don’t know that I’ve ever had such a hideously painful throat in my life before but my memory’s got further and further back to go these days so I can’t swear to it. OMG – the pain was excruciating. So much so that I – who have a phobia of being anywhere near a hospital – nearly took myself off to A & E on Sunday morning as swallowing was so painful and as I was trying to cough at the same time I thought it would cut off my breathing. As is clear, I am still here but have been silent since Saturday morning. Mr. T. had always fantasized about such a thing but was soon disabused of the notion it might be ‘a good thing’ when I was unable to answer requests, questions, commands, etc. yelled from the other side of the house but could remain serenely silent and await the yeller – being Mr. T himself or Mlle. T. the younger – to actually approach me and speak in measured tones. Then, the waiting game began whilst I scrawled my replies on a block of notes which finally became useful after years of perching on the edge of the desk. It transpired that, over time, where my handwriting has been abandoned in favour of the keyboard, it is now almost illegible. There followed scenes of what would have been hilarity if I’d been up to laughing, where husband and daughter tried to make sense of my scribble in a desperate attempt to communicate with me. I think I might actually try it again one day when I’m only pretending so that I can sit back and enjoy the show. In an effort to take my mind off the throat that seemed to have taken over my whole body and made it all hurt – I decided to press on with joining my F2F Block Swap quilt together and, encouraged by Kate, who is also joining one up with the quilt as you go method, and the fact that I sort of realised I’d quite like to present this to the husband for Christmas, I started cutting up the strips. I won’t bore you with the strips put on upside down, the not catching the binding in at the back first time round and all the other little mistakes I made in my Paracetemol/Ibuprofen Alternating state of mind but, suffice it to say, it didn’t go well at first. However, here are the top and bottom corners of the quilt, laid side by side for ease of ‘fit in photograph’ and now I have the right side to do which will consist of two sections of 3 blocks across x 3 blocks down. Then, there will only be one long vertical strip to sew down between the left and right hand sides and I will have a 5 x 6 block sized, husband sleeping on his own in London (at least he better be!) sized quilt. Kate was thinking that this method would avoid the necessity of doing long strips between each completed row and, so far, it seems to be a good idea. Kate explains it much better here should you be interested in going down this path yourself. Then this came in the post and I was very touched by it as Claire is always making little impromptu gifts for people and sending them out to them and it’s almost as if she knew I was in need of a bit of TLC. So germ infested hugs and kisses to you Claire for such a lovely thought – your timing was perfect. I love this ad from Poland which is really sweet and funny, encouraging for a post-Brexit Britain and so in the spirit of Christmas so, if you haven’t seen it yet, enjoy! I’m off to drink more honey and lemon in hot water – I’m almost up to adding a tot of something stronger in it but I’ll wait until after 6. Another ‘Quick’ Project – Yeah, Right. Whenever I see phrases like ‘quick project‘ , ‘make it in an hour‘, ‘I made a ball gown during the ad break in Eastenders‘ (o.k., I’ve never seen that last one) I should know not to touch it with a barge pole. If I ever say, I’m just going upstairs to run up a quick bit of gear to take on holiday or to wear for a ‘do’, my sewing machine and overlocker (but especially the overlocker) somehow hear me and, in the time it takes me to get up there, they have conspired together to make any quick project as long and frustrating as possible. Take the summer cardigan pattern which I saw on Girl Charlee’s blog and decided to make with a piece of jersey, dotted with cute gold fawns, that I had bought from them a few weeks before. Firstly, I had only bought a metre and the pattern calls for just over that so it took me (and a friend) at least an hour to try to lay the pattern out economically – although if it had been a non directional pattern it would have been a lot easier. Secondly and most importantly, my overlocker decided to thwart my plans and chew up the seams. I had to wait until I saw my friend again to use her overlocker and took mine with me to see if we could work out the problem. Her husband tutted at how ‘sale’ (French for ‘dirty’) my overlocker was and wanted to know how long was it since I’d cleaned it. I said ‘jamais’ (French for ‘never’). He tutted some more and swept out of the room bearing my machine aloft and did things to it with little brushes and blowers and things and I trusted him because I’ve seen under the hood of his car and the engine looks like something you could eat your dinner off. Anyway, despite his ministrations, it still didn’t work properly so I re-threaded it for what seemed like the zillionth time and, obviously deciding it had p***ed me off enough for one week as I had started muttering darkly about buying a new one, all was well. Anyway, I made the cardigan for Mlle. T. the younger but she’s not keen on modelling so I asked Mlle. T. the elder – who’s not keen either but she is more bribeable biddable. Next time, I would make the cuffs a little looser and alter the pattern slightly so that it is slightly wider at the bottom edge. …..and if anybody tells me the fawns on the cuffs are upside down I might get nasty. 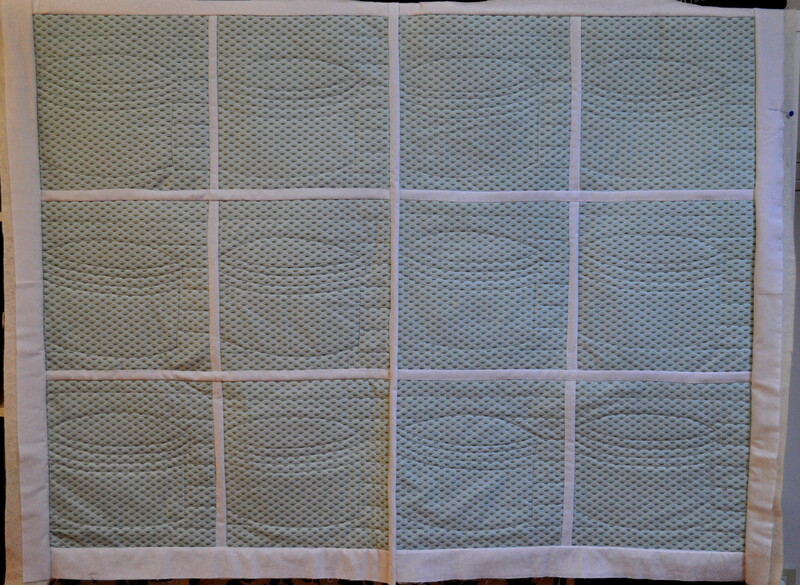 I am determined to get my F2F blocks made into a quilt for Mr. Tialys’s London flat before winter – although he has central heating there which we don’t have here so I don’t know why I worry. Anyway, yesterday I took all the blocks and the squares of wadding and backing out into the garden and went crazy with the basting spray so they are now all ready to quilt. I think one of the cats has a more bristly tail than she should have as she may have got in the way of me and my spray at one point. I’m sure it’ll brush out. Here she is, giving me the stink eye, in the antique french confit pot that should be for sale in my shop but is not as she has adopted it as her own and, having raised her from a 3 week old scrap with cat formula milk and bottle, I find it hard to deny her anything at all. I’m off to see if I can make a skirt – complete with zip – in under an hour. (The word zip is a clue here to the likelihood of my succes).